Army basic training exercises will not only prepare you for military service, but they can also provide a solid foundation for someone who aims to be in top physical shape. These exercises include strength training and cardio workouts, giving you two of the basic components of a fitness plan. Another advantage of these exercises is that they require no equipment. The elements of the Army fitness test include basic calisthenics exercises as well as running for endurance and aerobic fitness. Pushups and situps form the core exercises. These moves are good choices because they target large groups of muscles in single exercises. Running is an effective aerobic exercise which also burns significant amounts of calories. You are graded on an Army fitness test based on the number of pushups and situps in addition to a two-mile run, all in a set period of time. The starting point for pushups in women is three pushups. For men, it is 13. The number also varies with age. The minimum number of pushups a 17 to 21 year-old woman must do after basic physical fitness training is 13. To graduate from advanced individual training (AIT), the threshold jumps to 19. Pushups target the pectorals or pecs as well as the deltoids and triceps. Secondary muscles support the exercise, including the glutes, quads, and abs. The standard pushup is a challenging exercise. However, variations, such as the bent knee pushup or wall pushup, can make this exercise accessible no matter what your fitness level. As you gain strength, you can move on to the classic form. Situps also have a minimum number in the exercises for basic training. A 17 to 21 year-old woman will have to be able to do at least 47 to complete basic Army physical fitness training. The AIT requirement is 53. Like the pushup, the situp is a complete exercise for targeting the abdominal muscles. The primary muscles involved include the rectus abdominus and transverse abdominus. The oblique muscles are also engaged during the exercise. 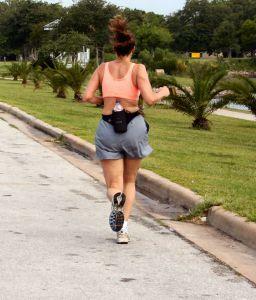 Running provides the aerobic endurance component of basic training. Your initial test includes a one-mile run. However, to graduate, you will need to do a two-mile run with a time of at least 19:42 for a 17 to 21 year-old woman. This benchmark represents a challenging figure. If you are new to running, you should begin slowly with a couple weeks of brisk walking before you launch into a running program. From there, you will begin interval training until you build enough strength and endurance to run continuous stretches. This break-in period is essential in order for you to avoid overtraining. This can result in shin splints and other injuries which can sidetrack your training schedule. You should rely on your own perception of recovery to guide you. You should plan on taking at least one day off between runs to give your body time to recover. To pass Army physical fitness training, you must score at least 150 points, with 50 points given for each training component. That means you can't rely on your great running time to compensate for poor pushup numbers. The purpose of physical fitness training is complete athletic performance. Even if you are not entering the military, it is an admirable fitness ambition to use this branch's perception of total physical fitness as your personal goal. Other types of exercises will support basic training exercises. For example, walks between running sessions will help you recover and keep you active. Other abdominal exercises, such as the plank, can offer different types of challenges for building strength. Bear in mind that your rest periods between workouts are a necessary part of your fitness program. Each of these exercises for Army training places high demands on the body. Over time, you will build strength and improve your fitness. These three basic exercises provide a blueprint for success.